Birds and other animals die every day in Oregon from a variety of causes. It is not physically or financially possible for ODFW biologists or other government employees to collect and sample every dead bird statewide. Following are some guidelines to determine when a dead bird could indicate a disease. 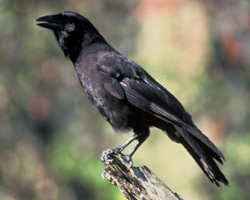 Use these guidelines to decide when it is appropriate to contact ODFW or your local health department about a dead bird. Read on for tips on what you can do to keep your birdfeeders free of bacteria like salmonella that could lead to bird deaths in your backyard. When multiple or clusters of birds are ill or dying. If the incident is unusual or unexplained (bird acting sick, dies acutely while flying). If you suspect that the bird died of trauma from hitting a stationary object (window, powerline), or moving vehicle (found on or near a road) or by predation (cat). Rather than calling a state agency, safely dispose of the bird using the guidelines below. If the bird is obviously injured (broken wing, leg), contact your local ODFW office for the name of a wildlife rehabilitator in your area. Directory of ODFW offices. 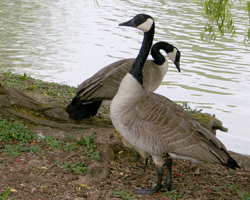 All injured waterfowl (ducks, geese, swans) should be reported to ODFW because the department is sampling these animals as part of its avian influenza monitoring effort. Birds that died from trauma or predation can be disposed of using the following guidelines. Avoid direct contact with the bird. Wear disposable rubber gloves while handling the bird or wear gloves that you can immediately put through a hot soapy wash. A dead bird can also be picked up by inverting a plastic bag on your hand and grasping the bird through the plastic. Double bag the bird in plastic bags and place in a sealed garbage can or other safe container where it cannot be disturbed by other animals. Do not bring the bird into your home. Do not eat, drink, smoke or touch your face with the gloves while handling the bird. Wash your hands with soap and water for at least 20 seconds after handling the bird. Providing fresh seed without mold. Cleaning feeders, water containers and bird baths weekly with a solution of one third cup of chlorine bleach per one gallon of water. Discontinue feeding for at least one month in the event that birds die at your feeder. 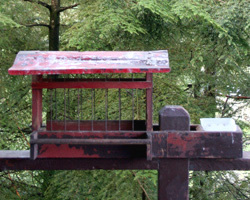 Remember to always wear rubber or plastic gloves when handling or cleaning dirty feeders.